Fiction. Short Stories. 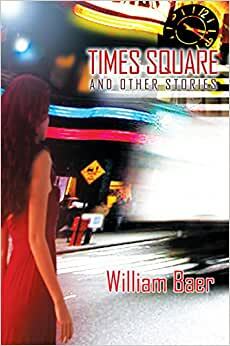 In William Baer's TIMES SQUARE AND OTHER STORIES, there are everyday characters walking extraordinary paths for love; there are smart, skillful characters struggling to reconcile their viewpoints and convictions with the status quo in fields such as art, education, the cinema and religious doctrine. There is baseball and the story of the skills, training and ethics of pitching in the big leagues. And there is war and an enemy invasion juxtaposed with a do-or-die chess game. The stories take us coast to coast from New York to LA, away to South America, and overseas to Eastern and Western Europe. This is a fun-filled, fact-filled collection that smoothly melds scholarship with the everyday for unique, fresh, and highly intelligent stories, which are also highly entertaining. "TIMES SQUARE AND OTHER STORIES, William Baer's twice-measured fictions, channel the reflecting reflections of James and Borges back into our self-conscious consciousness. Like the four-story signs plastering the 'real' Times Square, these signs sing themselves, maps as detailed as the things they represent. These fictions resuscitate Poe's unities of effects, breathing life back into the simulacrum of life. I loved this book; it can't help but blurb itself!" Michael Martone"
Start reading Times Square and Other Stories on your Kindle in under a minute. William Baer, a recent Guggenheim fellow, is the author of eighteen books including The Ballad Rode into Town; Luis de Camoes: Selected Sonnets; and Classic American Films: Conversations with the Screenwriters. His short stories have been published in The Iowa Review, Kansas Quarterly, The Chariton Review, The Dalhousie Review, and many other literary journals. He's also a former Fulbright in Portugal and the recipient of a Creative Writing Fellowship in fiction from the National Endowment for the Arts.